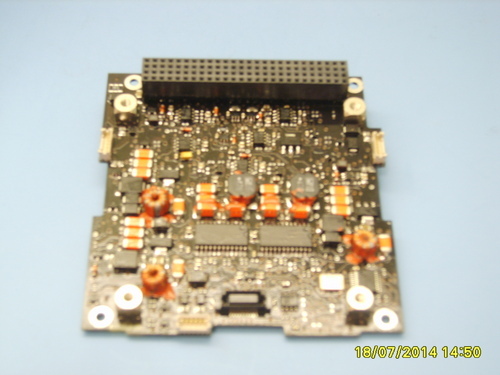 The role of the PSU is to provide electrical power for all the subsystems onboard the PLUME cubesat. This is will be achieved by the use of photovoltaic (PV) panels when the satellite is in direct sunlight and by two Lithium Polymer batteries when the Sun is eclipsed by the Earth’s shadow. Both of these will provide direct current (DC) power. The batteries are charged by the solar panels through three battery charge regulators (BCRs) which optimize the solar arrays’ voltages independently for maximum power transfer. Power is then transferred from the battery or directly from the solar panels through a number of power buses, rated at 5V, 3.3V and unregulated, to which the other subsystems are attached. Both the regulated buses have over-current protection, to prevent damage from any short circuit, and the battery has under-voltage protection to prevent a complete discharge. Telemetry and telecommand is provided to the PSU via an I2C bus which connects through the central OBDH/MCU through standard PC/104 connectors. Commands can be sent though this system and information returned on the battery’s current, voltage and temperature as well as the Solar panels’ current, voltage and temperature and the buses’ currents. For a more detailed desciption and block diagram see the attached documentation. The battery to be used consists of two Clyde Space Lithium Polymer cells, mounted together in series, side by side on top of the power generation board. It contains an integrated thermostatically controlled heater, battery telemetry and cell over and under-voltage protection and over-current protection. A battery board has been purchased from Clyde Space and will be used in the lab (see Testing below) to test the capacity, charge and discharge times etc. The actual flight battery will be identical but has not yet been purchased. The board contains the three BCRs which automatically match the solar panel voltage to their input voltage in order to transfer maximum power. Also contained on the board are the power buses which actually supply DC electrical power to the other cubesat subsystems. These are the 5V bus which is rated for a full load current of 1.2A and the 3.3V bus, rated for 1A. There is also a third unregulated bus. All three buses have over-current protection switches which prevent damage to the PSU in the event of a short circuit by switching the affected power bus off for a few milliseconds. They also contain telemetry units that can be called on to display the currents drawn from each bus. Finally the board also contains the TTC node which receives analogue inputs from the battery and power bus telemetry units and digital inputs from the I2C bus and can produce digital outputs for the I2C bus and an override command for the battery heater control. The outputs to the I2C bus are then sent to the MCU and back to mission control and can then be decoded with the calibration equations (see interfacing documents) to give telemetry on the current status of the battery and power buses. The Solar Panels will be attached to all 6 sides of the outside of the CubeSat, leaving 2 holes for the detector and another for the camera. They will consist of Clyde Space’s 1U CubeSat panels, made up of Spectrolab’s Ultra Triple Junction (UTJ) cells with an efficiency of 28%. For a diagram showing the arrangement and area covered see the Systems Definition Document. For further details on the cells see Spectrolab's manual. The power generation board and test battery have been purchased from Clyde Space and are currently being tested. Listed below are all the tests required. For more information see the attached Test Plan Document.